Many pet owners have found ways to use tea tree oil as a remedy for various pet aliments. 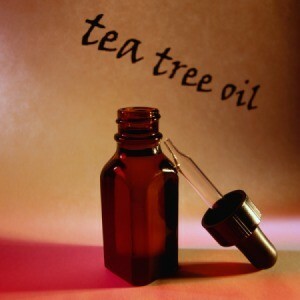 This is a guide about using tea tree oil for dogs. I took a red Solo cup (like Toby Keith sings about) and I filled it up about an inch full in the bottom with blue Dawn dishwashing soap. Then I put a capful, not a cupful, a capful of tea tree oil, which you can get at the pharmacy. It is in a brown bottle and it is around 12 dollars. It kills cats so don't use it on them. Then I fill the cup up with water and mix it with my hand. Then I set it aside in a safe place, and wet the dog with the shower. I really work the water into its coat. Then I pour the shampoo concoction on the coat of the very wet dog and rub it in. I keep putting more water into the cup and mixing it with my hand to get all of it out. I then massage this into the coat, deep down, like a wonderful massage. I wish I could say I leave it on for ten minutes, but that never happens. The most I have been able to do is about two minutes. Then I rinse and get all the shampoo off, all the time telling Dutchess how good she is and massaging her. After this is off, I take a human shampoo, just a small amount and put it on the top of her coat, just a small amount. I don't work this in. I quickly rinse it off. After I do this, I dry her off, since it is the winter here. Then I blow dry her and then I go in the car for a long drive in a very heated car, not so much as to be uncomfortable but nicely warm. This is a treat for taking a bath at all. Anyway, I did this before I took her in for her vet's appointment. She usually comes out with prescription shampoo, to get rid of yeast, and also pills and all sorts of expensive stuff. The shampoo he gives me is expensive and it has to be used each week. When the vet saw her coat, he looked all over her and said she was in such good shape that she didn't need the pills or the shampoo at all. He did say that the Comfortis is the best way to go for fleas now, because fleas are immune to the other topicals. With Comfortis, it doesn't matter if you get them wet, etc. So she is on this now. He said after Comfortis has been on the market for fifteen years, fleas will become immune to it also. Comfortis is a huge chewable tablet that they take like a treat and it is given once a month. After I did this bath and for weeks after, I noticed she really seemed to be happy and not digging on herself, like she does when she gets that buildup from the yeast, etc. The yeast will show itself on the skin by looking like mold, or black trimming around the ears. The vet had showed me this before. I had looked at her stomach a day or so after the bath and I could see where I actually missed. There were black dots on part of it where I couldn't see where I was massaging. The place the shampoo touched and was massaged in was perfectly clear of the yeast. I was really impressed with this recipe which is also a lice remedy when combined with white vinegar. It makes her happy. I don't think any other form of shampoo would be such an anti-fungal as the tea tree oil and Dawn. Dawn has long been used on animals and such. As harsh as it sounds, it is actually very gentle, and I always use it because I know how much I always used it on my foster animals. I really never thought of using it on a full grown dog, such as mine, but I am so glad I did and so is she. Remember to keep it off of cats. Also, never use oatmeal shampoo on dogs with a yeast problem because it only feeds the yeast and then they multiply faster. Looking for home remedy for pet with hot spots or best place to purchase tea tree oil shampoo. i couldnt find a homeade recipe for it,sorry. The best 'tea tree oil' you can find will be from Melaleuca.com. Through the website you can find a local person to buy from--Melaleuca Alternafolia is the purest tea tree oil out there--grown in a protected place in Aust.--and Melaleuca makes great products, all to help not only your dog, your shampoo, but also in cleaning agents for the household! I use a shampoo from Sally's Beauty supply. It's paul mitchell's tea tree oil shampoo, but Sally's has a generic version, called Generic, haha. It's in a white bottle with a black cap. It should be close to the paul mitchell or in with all the other generics. The small bottle costs about 5 bucks, and the huge bottle is like 10 dollars. It lasts a long time. It also has peppermint in which soothes the skin. I use this on my cat who has sever skin problems and I have used it on the dog who has hots spots as well. I also have a very sensitive scalp and I use it once a week to keep my skin from hurting near my part. Another perk is that I've found it lathers and rinses much easier than pet shampoo for skin, which felt more like dishwashing liquid than shampoo. I buy my Tree Tea Oil Shampoo and Conditioner from http://www.Aloetherapy.com Very reasonable and a good Aloe Vera company. Aloe is in their products and it is very good for the skin. Very soothing and healing. You can add about 10 drops of TTO to regular baby shampoo, or 10 drops of TTO to 8 OZ of warm water. Rinse the dogs with it after bathing, or mix in spray bottle. It really works on hot spots on my dog. We finally found out it was the dog food that was giving him hot spots. Now he eats lamb and rice food. Tea tree oil is toxic to dogs and cats. Don't use on them. There are pet shampoo brands on the market that include tea tree oil. You should never use products that are not formulated for use by a dog or cat. What are the side effects of spraying a small dog with bad case of fleas with diluted tea tree oil directly onto the coat? If it is a bad infestation, it is cheaper to get the shot at the vet that kills them all within less than a day. Then you can treat your house by vacuuming all the time and putting a flea collar in the vacuum bag and a plastic over the end of the hose, so the fleas don't get out. I always sprinkle the rugs, under the bed sheets and etc with salt and just leave it for a few days. Fleas dislike salt. I use tea tree oil on my own hair for lice treatment if I ever find a live one in my hair. I use about 1/3 cup dawn and 1 1/2 teaspoon tea tree oil, it stinks a lot like Vicks, and then about two tablespoons of vinegar. I put all this in my hair and leave for 15 minutes. This is great and it kills lice. Don't know if it will kill fleas or not, but never use on cats as tea tree oil can kill them. If you have a really bad infested kitten with fleas, I would use baby shampoo and peroxide mixed up and leave it on the kitten for about 7 minutes and then rinse off. Keep the kitten warm, kittens get so stressed and feel hot and cold more than other animals so be sweet and loving and talking softly. I bought my little bottle of tea tree oil at Walgreens pharmacy. I personally would try diluted Grapefruit seed extract. It is non toxic to humans & animals. Can be given internally or externally. http://www.nutriteam.com/pets.htm I bought my 2oz bottle in the Health food section on Fred Meyers. It can also be bought on Amazon or other sites. Remember Tea Tree Oil is extremely toxic to cats. Can you use tee tree oil in a dog's ears? No... It can cause them to hearing loss. I used the Solo cup recipe, and it is working. Yay! The article said that you bathe the dog often. How often can I use the TTO shampoo recipe on my dog without overdoing it? I just did the Solo cup recipe tonight. I pray it works. My little girl doesn't feel good and this skin yeast irritation came up quickly. My vet told me to do it twice a week. Or you can by the Aloevine horse shampoo as well and it is suppose to do the trick. What is the Solo cup recipe? We fight yeast infections with our dog often.